Zombies GO lets you fight zombies in the REAL WORLD with your iPhone! You wont believe your eyes! How long can you survive?? WE DID IT WAY BEFORE POKEMON DID! GRAB IT FOR YOURSELF AND SEE WHAT ALL THE FUSS IS ABOUT! Seriously, you’ve never seen or played anything like this before. Gyro controls let you simply look around with your iDevice as if you’re taking a photo! Try it for yourself! NEWS FLASH The undead are rising. They’re in your city. They’ve invaded your town. They’re feasting on your neighbours’ delicious grey matter. THEY’RE EVERYWHERE! Introducing Zombies GO! The Augmented Reality Apocalypse! 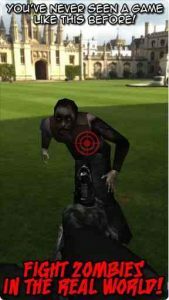 More than just another shoot-zombies-in-the-face game, Zombies GO uses Augmented Reality to put zombies in YOUR WORLD. They’re all around you right now! You’ll see zombies climbing out of the ground around you. You’ll hear them groan. You’ll see them eat each other. You’ll grab a gun and blow their stupid undead brains out. Totally immersive Augmented Reality puts zombies all around you in the real world. IT’S LIKE THEY’RE REALLY THERE! Fight zombies in the real world, OR in a virtual environment! Now you can enjoy zombie slaying even in the smallest of spaces! Different undead enemies! The longer you survive, the more different undead nasties will show up! Fight zombies, undead dogs, mummies and MORE! As you kill the walking undead, you unlock new weapons! Including AK-47, Shotgun, 44 Magnum, Flame Thrower, Mini-Gun, Sniper Rifle and MORE! 2 Modes: Play the game and try to survive, or switch to SAFE MODE and enjoy the Augmented Reality effects without being attacked! You can still blast the lifeless walkers to hell tho! Unlock weapons within the game to use in Safe Mode. Your movements control the game. Simply look around you, line up your cross hairs with your target, and tap to shoot. Swipe up to reload, then keep shooting! It’s totally different to anything else, and very addictive! WARNING: When using Augmented Reality please be aware of your surroundings! Be careful of the people and things around you. It’s easy to be completely immersed in the Augmented Reality Apocalypse and forget where you are! Get more great games and amazing free apps from our website, and give us your feedback while you’re there! Compatible with iPhone 4, iPhone 4s, iPhone 5, iPhone 5c, iPhone 5s, iPhone 6, iPhone 6 Plus, iPhone 6s, iPhone 6s Plus, iPhone SE, iPhone 7, iPhone 7 Plus, iPhone 8, iPhone 8 Plus, iPhone X, iPhone XS, iPhone XS Max, iPhone XR, iPad, and iPod touch.